"Bend, come on now, work at it. Stretch hard, harder. Pull more. Let's go!" 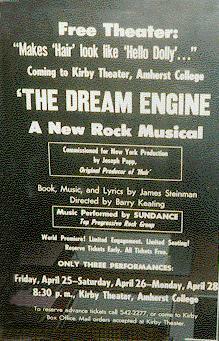 Barry Keating, AC '69, is warming up the tribe for a new rock musical, "The Dream Engine." The show, written by Independent Scholar James Steinman, AC '69 is being presented this weekend at Amherst, and next weekend at Mount Holyoke. The musical has already been optioned for New York production next year by Joseph Papp, the producer of the world famous New York Shakespeare Festival and the man who presented "Hair," the first musical in America to use rock music. "The Dream Engine" will use many of the techniques of the avant-garde radical theater, most evident in the work of the Living Theater from New York, who completed a controversial American tour this spring. The play concerns the role of revolutionary tactics in America, 1969. "It has been a trying experience," the author said, "from beginning to end. But it has been the most exciting thing I've ever done. It may offend some people, but I think it will stand on its own as a work of art." Steinman also produced "The Beard" at Amherst last year, and scored the music for Kirby's production of "A Man's A Man." Steinman also portrays Baal, the main character in the musical; he describes the character as a cross "between Che Guevera, Mick Jagger and Billy the Kid." During the play, Baal interacts with a tribe of young men and women who have reverted to a violent, primitive life on the coast of California. The tribe performs the pulsating rituals which accompany the rock music of the score. The entire production is an extreme departure, Steinman noted, from the musical style of "Hair." He felt that the characters from that Broadway success are already out of date. "The flower child, sunshine hippie has been replaced with a far more dangerous kind of the kid, conditioned by the brutality of assassinations, a war that goes on forever, police riots in Chicago, a political system that refuses to change. American children," Steinman said, "are being transformed into revolutionaries, willing to fight in the streets if necessary. I think its more dangerous to live in Greenwich Village today than to fight in Vietnam. The play tries to reflect that physical and moral danger. This is not, I think, the usual kind of musical." The musical score is being performed by "Sundance," a top local rock group from Amherst College who have appeared with "Cream," and will be appearing shortly with "Blood, Sweat, and Tears." The production has been innovative in other areas besides script content and the rock music. Director Barry Keating, also an Amherst Independent Scholar, has spent a great deal of time working with the cast in group exercises so that they perform as a whole, with a feeling for each other's actions. He is also experimenting with lighting and scenery effects so that the audience can be brought closer to the action on stage. Keating directed the highly acclaimed "Threepenny Opera" produced earlier this year at Amherst's Stone Theater, and has assembled a large cast of singers and dancers for "The Dream Engine." In sheer size, this show is probably the most elaborate student production ever offered in the four-college area. Tickets for the AC performance, (no charge), April 25, April 26, and April 28 (Monday), are available at the Kirby box office, or by calling 542-2277. For tickets (admission charge), MHC May 3 and 4, call 536-4000, ext. 252, or write Susan Richardson, Ham Hall, Mount Holyoke College, So. Hadley. All performances are at 8:30 p.m.